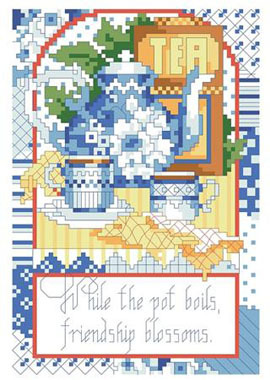 “While the pot boils, Friendship Blossoms” Tea for Two and Two for Tea, a warm friendship for You and Me. This delightful small design would look lovely in a sunny kitchen. Stitch it onto a larger piece of linen for a one-of-a-kind towel hostess gift. Contents: Stitch Count 62w X 90h, Finished Size: 5" x 7"